Start up costs are the costs which you incur before your business starts. They can be separated into expenses, such as legal costs which are charged to the profit and loss account and form part of the opening reserves of the business, and assets, such as furniture, which are capitalized and form part of the opening balance sheet of the business. The total start-up cost, expense and assets, must be matched by start up funding, in the form of supplier credit (accounts payable), other liabilities, debt such as bank loans, and capital from investors and from the owner of the business. The small business start up costs Excel sheet, available for download below, helps a business calculate the start up costs and funding by entering values for expenses, assets, liabilities and equity. Providing the start-up costs and funding match, then the template will produce an opening balance sheet. The start-up costs calculator is available for download in Excel format by following the link below. Users use this business startup costs calculator at their own risk. We make no warranty or representation as to its accuracy and we are covered by the terms of our legal disclaimer, which you are deemed to have read. 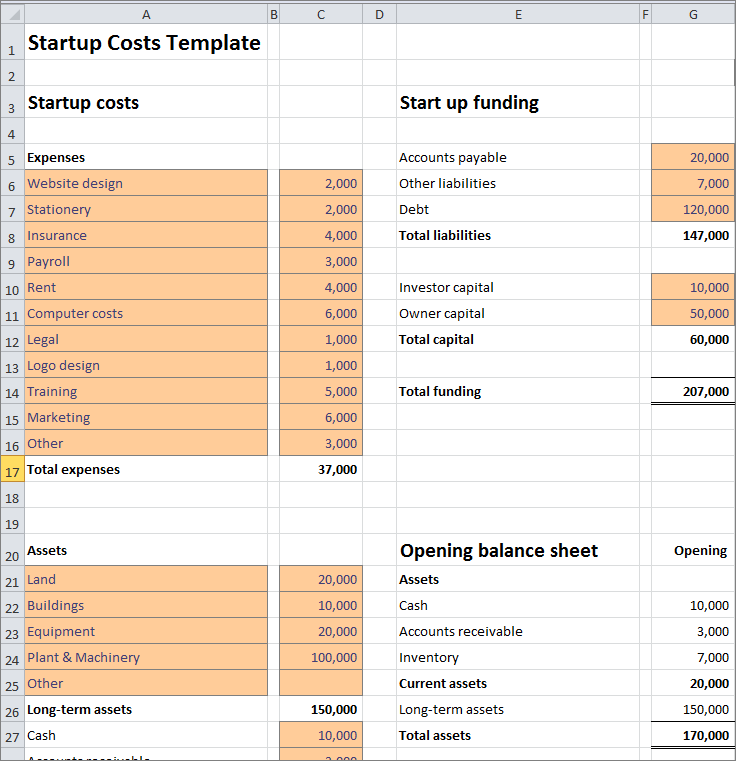 This is an example of an startup cost template that you might use as part of a business plan. It is purely illustrative. This is not intended to reflect general standards or targets for any particular company or sector. If you do spot a mistake in the ecommerce startup costs calculator, please let us know and we will try to fix it.